Can you swim with an ostomy? Yes! You should talk to your doctor about when it is appropriate to start physical activity after surgery, but swimming with an ostomy is certainly possible. Since 2009, the President of Stealth Belt, Richard O'Hamill, has enjoyed watersports to the fullest. Growing up on the lake in beautiful East Tennessee, Richard fell in love with swimming and surfing. Yet, after his ostomy surgery ten years ago, he was unsure if he'd be able to return to the water. This fear left him seeking solutions. Thus, the Neoprene Extreme Stealth Belt was born. 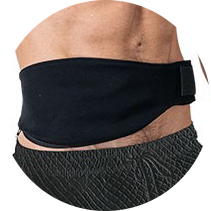 The Neoprene Extreme belt is built to withstand the impact of surfing and wake boarding, making it the ultimate solution for watersports enthusiasts. With a quick drying neoprene exterior, the Neoprene Extreme provides the support and protection needed for any water activity.